Johnsonville’s Big Taste Grill will be joining NASCAR Canada at the Honda Indy Toronto from July 15 to 17 at Exhibition Place, the first time it’s been in Canada in 10 years. Not only will NASCAR fans have the opportunity to enjoy delicious Johnsonville Bratwurst sausages cooked on the grill, but they’ll also have the opportunity to meet Ontario-born NASCAR star Adam Martin, who will be racing at the Indy in the Pinty’s Grand Prix on Saturday, July 16. The Pinty’s Grand Prix is the highest-profile stop of the NASCAR Pinty’s Series, and will be Saturday’s feature race at the Honda Indy in Toronto. The race marks the first time NASCAR’s been at the Indy, Ontario’s largest annual sporting event, since 2011. The Big Taste Grill will have a huge presence throughout the Honda Indy. It will occupy a 100 x 80 foot spot prominently positioned in Thunder Alley, right by Turn 11 on the 1.75 mile-long street circuit, where it will grill up Johnsonville’s delicious Bratwurst Sausages for race fans all weekend long. With 40 square feet of grilling space and the capability to cook 750 brats at a time, Johnsonville’s goal is to sell between 1,200 and 1,500 Bratwurst Sausages an hour (over 20 sausages per minute), with $1 from each sale going to Make-A-Wish® Canada and a minimum of $10,000 being donated to the charity. Make-A-Wish® Canada volunteers will be on-site grilling up brats and serving customers as they take in the sites, sounds and tastes of race day. 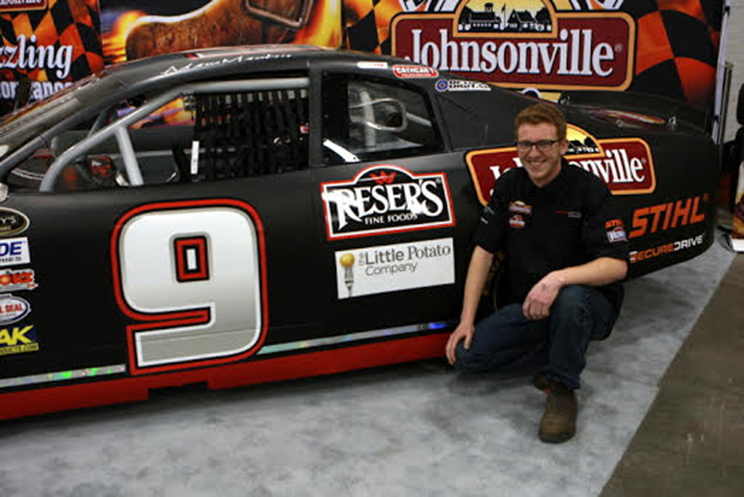 On top of enjoying Johnsonville’s delicious Bratwurst Sausage as they take in the festivities, NASCAR fans will also have the chance to meet and see the car driven by 18-year-old NASCAR sensation Adam Martin. Martin, who is from Ayr, Ontario, stunned racers and fans alike at his NASCAR Pinty’s Series debut on June 18 at Sunset Speedway, battling a star-studded field of stock car racers to score a stellar fourth place finish. Read the article here. Martin’s 2016 racing program is supported by Johnsonville Sausage. Johnsonville is a family company, and its Big Taste Grill is steeped in family lore. In 1984, the company’s first direct-sales force began with Johnsonville family members traveling around in a RV, grilling sausages on the spot and offering samples to grocery store owners to secure distribution. 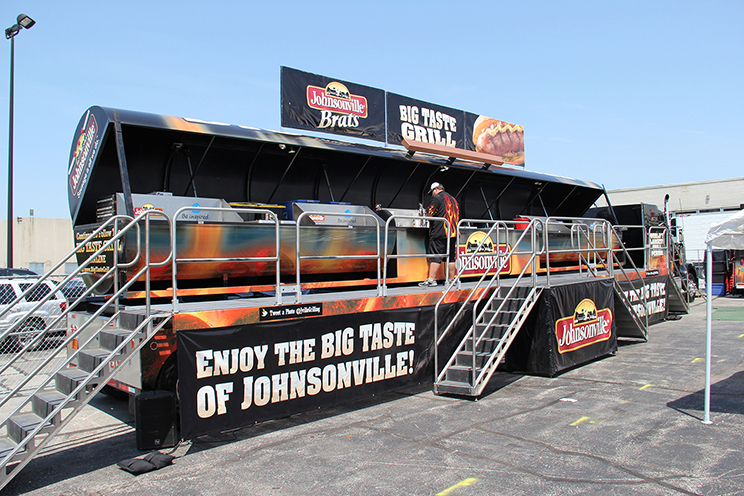 Today, the Big Taste Grill delivers the same Johnsonville experience on a much larger scale. Adam Martin will be on site with The Big Taste Grill on Friday, July 15 from 2pm – 3pm and on Sunday, July 17 from 11am – 1pm. 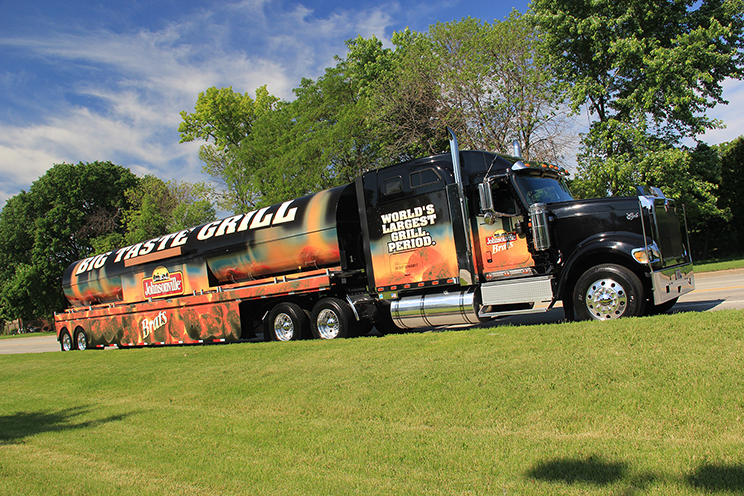 At 20 feet tall, a whopping 65 feet long and 6 feet in diameter, Big Taste Grill is the world largest BBQ. Just to park it you need a space that is 20 feet by 90 feet. It can cook 2,500 brats an hour, or 750 bratwurst at a time on its 40-square-feet of grilling surface. To give the chefs plenty of room to move about as they grill the flavourful sausage, the grill has a 4 foot aluminum walkway along its border. To date, the Big Taste Grill program has raised more than $4 million for a variety of charities worldwide, many of them local community organizations. In 2015 alone, the Johnsonville Big Taste Grill raised more than $132,000 for 42 different organizations. Eighteen-year-old Adam Martin has been a NASCAR racer since 2013. His three-year career highlights include a fourth place finish in his debut race at the NASCAR Pinty’s Series at Sunset Speedway on June 18, 2016, and being awarded Rookie of the Year in 2014 for NASCAR’s Thunder Car division. The Ayr, Ontario resident will be attending Conestoga College in the fall of 2016, and is a graduate of Bluevale H.S. in Waterloo, Ontario. Prior to NASCAR, Martin raced 2-Stroke Karts in Ontario, Quebec, Florida and Louisiana for three years. Johnsonville, Wisconsin is a town built on sausage, for sausage and by sausage. We started as a small, family-owned butcher shop in 1945 dedicated to crafting the best sausage around, and 70+ years later, that hasn’t changed. The delicious sausage made in the butcher shop came from an old family recipe, which made its way down the family tree from 19th-century Austria. Today, that family recipe remains, and only 3 people in the world know the secret ingredients for Johnsonville sausage. Johnsonville employs approximately 1,600 members and the brand is distributed in over 40 countries around the world. The company remains privately owned today. For additional Johnsonville company information, new product news and the latest recipes visit www.johnsonville.ca.